Brio Leadership works collaboratively with leaders and team members to facilitate change and build a great company culture. Our experience in shaping vibrant company cultures ensures we design and implement highly functional organizational missions, vision and values, then facilitate the creation of strategy statements and strategic plans. ​We ensure that all the operational units are marching together toward annual goals and objectives. ﻿Peter Drucker famously quipped, “Culture eats strategy for lunch!” What he meant is that, while strategy is vitally important for a company, it’s the people in your organization who will make or break your strategy. The company culture that you create, either intentionally or unintentionally, will determine the velocity with which your company grows. Why leave culture to chance? Brio Leadership can help you assess your current company culture and identify the positive and negative values and norms currently in operation. Then, in a leadership workshop, we deliver the results of the audit and our recommendations. Together, we create a plan to mold your culture into a high performance one! ﻿Beware however: Cultural Transformation occurs over time. 18-36 months is not an unreasonable project duration for achieving cultural changes in a smaller company. Larger company transformation efforts are measured in years. In addition, Brio Leadership can measure the climate, or employee perceptions, of your organization. ​Climate indicators are helpful in identifying the levers you can push to improve your culture. Utlimately, culture is changed through shared learning and mutual experiences, and leaders are the biggest contributors to company culture. That's why we focus so much of our recommended interventions on leadership development. As Dr. Ron Cooke, CEO of Human Synergistics, has quipped, the best ways to change a culture is through leadership development and compensation programs that are aligned with core values. In administering the culture audit referenced in the process above, Brio Leadership conducts the Organizational Culture Indicator (OCI) survey from Human Synergistics. This highly validated and reliable instrument was created by University of Michigan and University of Illinois professors and has been used for over 25 years to measure the behavioral norms of your organization. The OCI is conducted as an online survey in which participants are asked to rate their current and their desired culture. Results are presented in a circular graphic called a "circumplex." 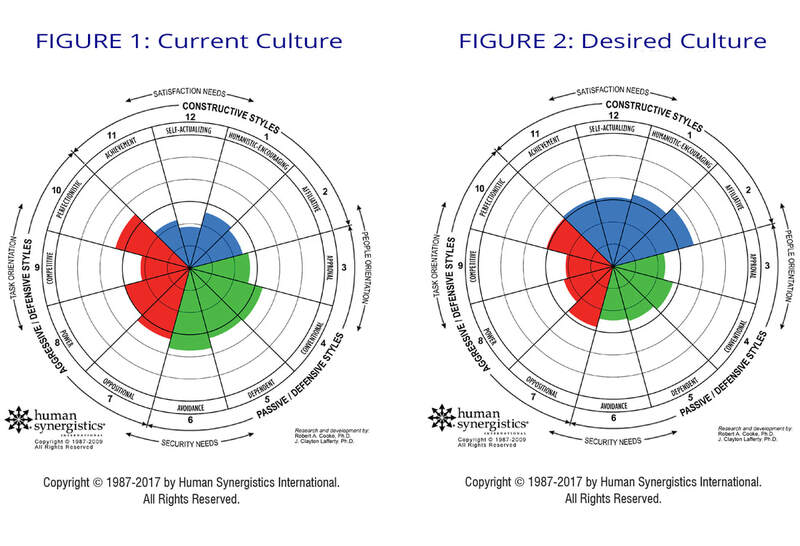 At a glance, you can see the health of your current culture (blue represents the amount of constructive behaviors measured) vs the desired culture. On behalf of all of us at Salmon Sims Thomas, I want to thank you for your brilliant presentation and summary of our Company Culture Audit today! thorough, prepared, knowledgeable and likable! We look forward to shaping our future together." ﻿On behalf of all of us at Salmon Sims Thomas, I want to thank you for your brilliant presentation and summary of our Company Culture Audit today! You were everything we had hoped for: thorough, prepared, knowledgeable and likable! We want you and your team to experience Happy Mondays. We want you to stand at your front door on Monday mornings and see the smiling faces of your employees as they enter the office, hear their excited chatter as they joke with their colleagues, and feel the excitement of them arriving to begin another productive, challenging week of work! To achieve remarkable results, call Brio Leadership today at 817-577-7030 for more information or contact us by clicking here.